I write all my business plans, case studies and marketing plans in Microsoft Word. Everything! When I worked in technical writing, I wrote very long user guides and technical specifications in Word, some which were more than 200 pages long. So, how do you write large reports in Microsoft Word that don¡¯t crash? The biggest problems when writing long documents in Word, such as Annual Reports, tend to involve formatting, styles, graphics, tables, and bullets. In Word 2007, click Microsoft Office button, Word Options and Save Tab. Here¡¯s how to make sure your Word documents don¡¯t crash. Formatting ¡ª don¡¯t cut and paste material directly from one file into another. This brings in unwanted Styles in the target Word file. Instead convert it to plain text and then import it. Apply the correct styles in the source document, for example, your Business Plan. Styles ¡ª create specific styles and avoid over-riding the default settings. Avoid using the default settings in the Normal.com template file. Instead spend a few hours and develop a bullet proof Microsoft Word template. Then use this for all your business writing. While this takes time up front, it saves more time in the long run. Graphics ¨C don¡¯t cut/paste graphics into Word. Instead, either reference the images with Insert, Picture and then Reference OR add the images to a new folder and add them from there. The problem with pasting in images is that if the Microsoft Word document is at capacity ¨C and you paste the image ¨C it may crash and destroy the formatting, text, and image locations. Insert graphics after the core content has been written! Tables ¡ª don¡¯t use the default Word auto-format settings. Instead create new Tables and add these to your business template. Keep the design simple and make sure it prints out cleanly. Avoid using striped tables. These degrade when you print and also can look very different when saved to PDF. Bullets ¡ª use styles to create bullets, numbered and other types of lists. Avoid using the toolbar and menu options to create bullets and try to avoid over-rides. Bullet lists will cause more damage than any other feature in Word, especially if you cut/paste from different documents. See Bullet Lists Do's and Dont's. 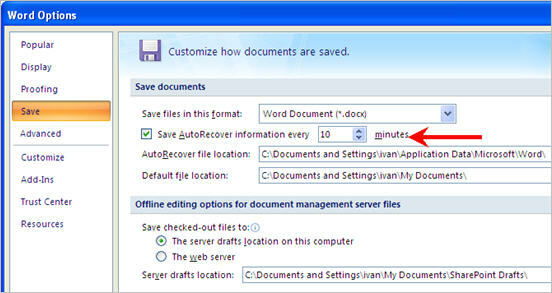 Default Setting in Word ¨C Turn off Allow Fast Save and Save Auto Recover. In Word 2003, go to Tools, Options, Save, Allow Fast Save. In Word 2007, click the Microsoft Office button, then Word Options and the Save Tab. Language ¨C Make sure this is set to the correct language setting. Why? If you try to insert characters from other languages you may create a conflict in the Normal.dot file. Also, if your language settings are in, for example, French and you do a Spellcheck, it won¡¯t find the spelling error you expected. Other good habits ¨C don¡¯t leave the file open when you leave the desk. Instead, close it when you go for a break. If you leave the file open all day ¨C and keep making saves ¨C Microsoft Word will keep making TEMP files in the background that incrementally increase the file size. Those are a few ways to reduce the file size of your business and technical documents.